In September 2007 Alessandro Troncon was the first Italian to win 100 international caps, becoming only the seventh player in history to reach the milestone. 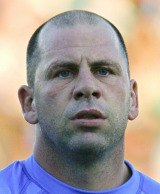 He made his debut in 1994 against Spain and his international career spanned thirteen years, establishing a long-running partnership with fly-half Diego Dominguez. He captained Italy at the 2003 Rugby World Cup, but a serious knee injury shortly after the tournament ruled him out of the 2004 Six Nations campaign. He retired after the 2007 Rugby World Cup in France.